The thought of saving money by buying a fixer upper is tempting. We watch HGTV shows like Fixer Upper and Flip or Flop, and think "I can do that!" There are a lot of steps involved in flipping a house, some of which you can DIY, others which will require professional help. Let's look at what it takes to flip a home and if it makes sense with your budget. A fixer upper is a home in need of renovation (sometimes extensive) which you can purchase for below market value. With the money you save, you can make improvements and customize the home. Although doing the work yourself will save money and be rewarding, it will typically take longer than having a professional do it. You'll need to figure out what you can handle and what needs to be hired out, in order to make the most of your budget. 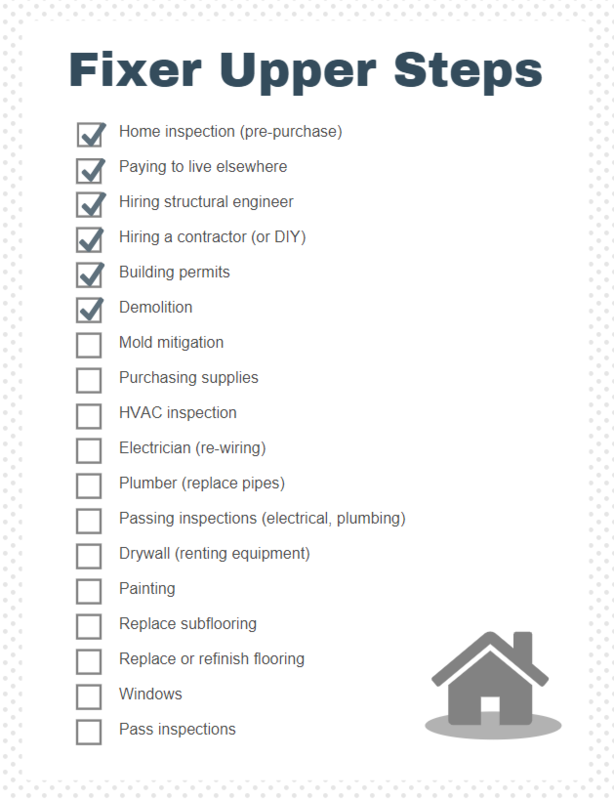 Although it will take more than 80 steps to fix a fixer-upper, let's begin by looking at some of the most important steps. An important first step in renovating a fixer-upper is obtaining a building permit. The city or county will require a permit for most renovations and it can cost you $200-$1000 depending on your location. If you think you can get away without a permit, think again. Building inspectors are out checking on other sites that do have permits and, if they notice work being done on your house, they can stop and ask to see your building permit. You may face a fine and have to stop renovating until you are approved for a permit. Doing unpermitted renovations may cause issues when you try to sell your home too. For example, if a seller's inspector reports a 1000 square foot addition that wasn't permitted, the structure may have to be torn down. This can cause you to lose the sale and will likely decrease the value of your home. Now that you've got your permit, it's time for demolition. You can do this yourself at no cost and it can be a lot of fun, but it's hard work. With a sledge hammer and a few other tools, most homeowners can remove drywall and flooring without professional help. Once you expose the surfaces underneath, you may need to address subfloor problems, outdated wiring and plumbing, as well as pest issues. You'll need to spend part of your budget on new materials and possible hire professionals to fix underlying issues so you can pass inspections. An experienced contractor will make sure the necessary inspections are completed. If an inspection fails, you may have to wait weeks or months before an inspector can return to review the work. Be aware that you can fail inspections multiple times, but the inspector will make you aware of the changes that need to be made to pass. Once you've learned about issues with the home, passed inspections, and paid professional contractors, you can move on to reconstructing rooms. At this point, you may have acquired many unexpected expenses. Take time to re-evaluate how much you can afford to spend on drywall, flooring, windows, cabinets, lighting, etc. This important step may save you from having to charge an excessive amount to your credit card. When the time comes to buy building supplies, do your measurements not once but twice. You'll want to make sure you buy enough drywall, for example, to complete the project without having to make a second trip to the store. If you're doing cosmetic renovations, remember to measure spaces for furniture and rugs before making purchases. Nothing like buying a large chair and ottoman only to find out they take up the majority of the space in the living room and need to be returned. 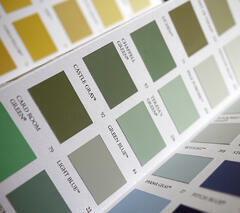 When buying paint, buy a variety of samples and paint 12" x 12" swatches on the wall. This will save you a lot of in the long run. Who wants to paint an entire room only to learn the color is too dark for the space and then having to repaint it? Look at the paint swatches at varying times throughout the day to see what they look like as the light changes, then make your final decision. As you approach the finish line in your home renovation project, it's worth investing in a few outdoor improvements to compliment the work you've done inside. If you have money left in your budget, plant small shrubs and attractive plants near the front entrance. If your lawn is thinning, fertilize and seed or invest in sod. The first impression of your home will draw visitors in and then you can wow them with the renovations you've done inside. Now that you have a better idea of what's involved in renovating a fixer upper, and you're willing to take on the challenge, it's time to find a below market value home. When you find a home you're interested in, get a home inspection and a structural inspection before finalizing the sale. Get your permits and begin demolition. This is going to be an amazing journey!